Given the body of work that he established in the ‘60s with partner Art Garfunkel, Paul Simon had no problem duplicating that success in the ‘70s as a solo artist. That is evident on his 1972 self-titled debut–a somewhat stripped-down affair that showcases his impressionistic, lyrical songwriting and musical eclecticism. The album’s two memorable songs are the reggae-influenced “Mother Child and Reunion” and the playful “Me and Julio Down by the School Yard,” but the other tracks shouldn’t be overlooked: the lovely “Duncan” brings back Los Incas, who contributed to Simon and Garfunkel’s “El Condo Pasa”; “Everything Put Together Falls Apart” and the yearning “Congratulations” are eloquent ballads; and “Armistice Day” incorporates a bit of funk. There Goes Rhymin’ Simon (1973) continues much of the same as its predecessor—a good portion of the songs were recorded in Muscle Shoals in Alabama: the soulful influences could be heard in another Simon classic “Kodachrome,” the New Orleans feel of “Take Me to the Mardi Gras”; the wistful and lovely “St. Judy’s Comet”. and the gospel-ish/doo-wop hit “Love Me Like a Rock,” featuring the signature vocal contributions of the Dixie Hummingbirds. Again, Simon is a master of the ballads especially on the jazzy “Something So Right” the lush and orchestrated “American Tune” is another fine example of his compelling and insightful songwriting. 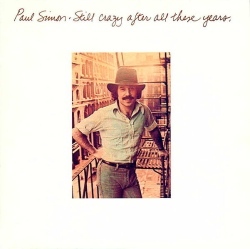 Simon’s triumphant work during this period is the Grammy-winning Still Crazy After All These Years (1975), a reflective work highlighted by the memorable title track and the funky pop “50 Ways to Leave Your Lover”; its other noteworthy tracks is a reunion with former partner Garfunkel on the bouncy “My Little Town,” the gospel-influenced Gone at Last with the late Phoebe Snow and the Jessy Dixon Singers; and “I Do it For Your Love,” a breezy-sounding meditation on domesticity. Just like Simon & Garfunkel’s work, these Paul Simon’s solo recordings from 40 years ago still resonate. Recently reissued this time on Columbia/Legacy, which also includes Paul Simon in Concert: Live Rhymin’, each of Simon’s first three solo albums carry bonus tracks of mostly demo songs.